Going meatless for a Paleo dinner or two? There are plenty of healthy and colorful options available in the vegetable section, whether you are shopping at your local market or grocery store, just as there are limitless recipes for vegetarian cooking too. It is always a good idea to have a handful of veggie recipes, such as Southwest-style vegetable cauliflower rice, up your sleeve when you are cooking for guests, as you never know when they will be requested. 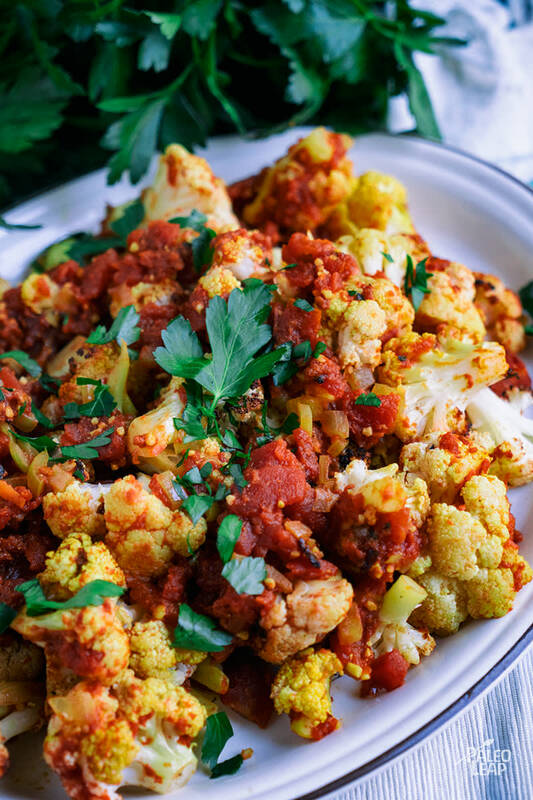 Keep in mind that a vegetable dish can be more than just a side serving, so treat it that way when applicable – you can even use an entire head of cauliflower at once! Actually, cauliflower is one of those “Brassicas” that we could eat every day, and the cauliflower recipes are nearly endless as well. You can blend it up in a kale soup, make the most delicious gluten-free pizza crust, stir it in a chowder or bake a tortilla. See, near-infinite inspiration from a humble head of cauliflower. A mix of leafy greens sautéed in a splash of coconut oil and sprinkled with toasted sesame seeds would be the perfect suitor to this curried cauliflower. However, if you wish to add a touch more protein to your meal, may we suggest some ethically harvested shrimp? As shrimp need to be combined with some sort of fat, the coconut oil in the curry will do nicely – fat, garlic, lemon juice and all. Melt coconut oil in a skillet over medium heat. Add the cauliflower and cook until soft, about 4 to 5 minutes. Add the garlic and onion; cook another 2 to 3 minutes. Drizzle the lemon juice, and sprinkle with cinnamon, curry powder, then season to taste. Stir in the diced tomatoes, and cook until everything is nice and soft, 8 to 10 minutes.